This is my attempt to add a fascinating detail. I alternated white and brass-colored ends in the warp stripe. In a similar fashion, I alternated colors in the weft stripe, too. It’s an experiment. The short columns that emerge in the weft stripe are a result of this thread arrangement. The outcome looks promising. Wet finishing will reveal the final effects of this low-risk exploration. M’s and O’s (Sålldräll) with a warp stripe and weft stripe that have alternating light and dark threads. I like to do experiments on the loom. Little risks open up possibilities and ideas for future projects. Every learning experience is a step that leads to insight for future learning. And I have so much more to learn! 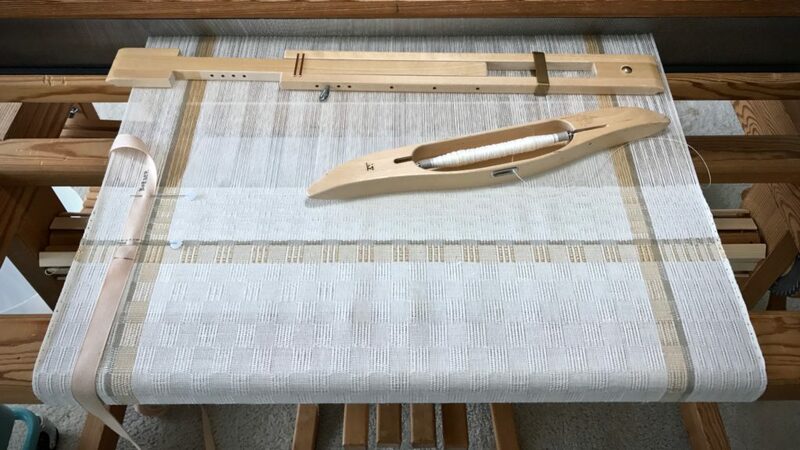 Weft stripe signals the beginning of the end border for this long table runner. 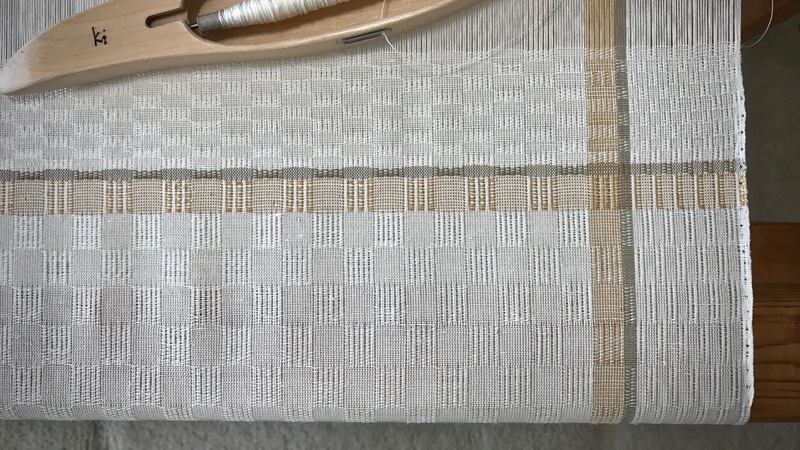 Short vertical columns take shape in the brass-colored weft stripe. Step-by-step learning has some common ground with finding a good path for life. Walking the right path is like walking in the early morning. The dim light of dawn gradually increases and the pathway becomes more and more clear as the sun rises to the full light of day. Our Creator gave us a lighted path. The learning experiences from our experiments and explorations in life help us discover the path of the Lord, where the light beckons us. Walk in the light. It’s where we can see the next good step. Hi Olivia, Thank you for asking. I’m not able to share the draft, but I’ll see if I can explain what I did. 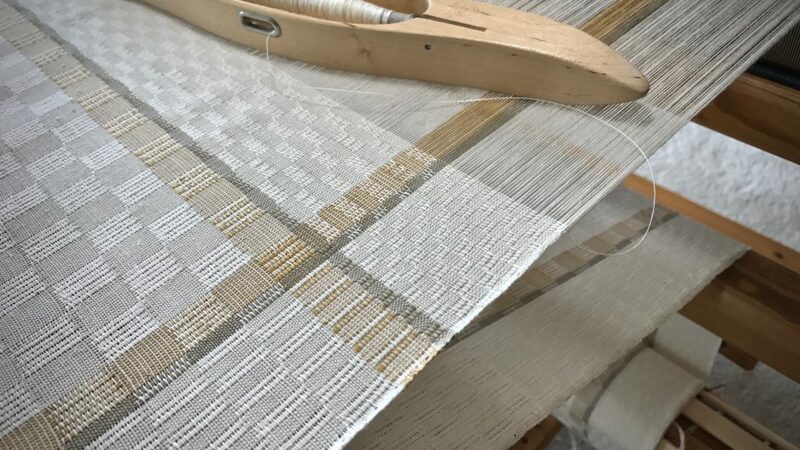 This warp is threaded as M’s and O’s, which is a four-shaft weave with two blocks. For the warp stripes, I threaded the narrow beige stripes all one color. But for the brass-colored stripes, for that block of the threading, I used the brass-colored thread and the white thread, alternating the two colors. And then for the weft, again, the narrow beige stripe is all one color. And the brass-colored stripe uses two shuttles – brass, and white. By alternating the colors, I get the fascinating little vertical brass/white stripes in one block of the M’s and O’s, making it look more complex than it is. Does that make sense? Let me know if that answers your question. I also like to do a little experimentation on the loom, and always plan extra warp to give me that opportunity. It sounds like you did a little planning in advance with the warp stripe to allow playing with weft stripes as borders or accents. Very smart use of your time, and a great way to play! Hi Nancy, I’m a big fan of putting on extra warp for play and experimentation. You are correct, I did plan these stripes in advance. I even used weaving software to try to see how it would look. I think of the whole endeavor as an experiment, though, since I’ve never tried alternating colors like that with M’s and O’s. It’s exciting to finish working it out as I do the weaving!